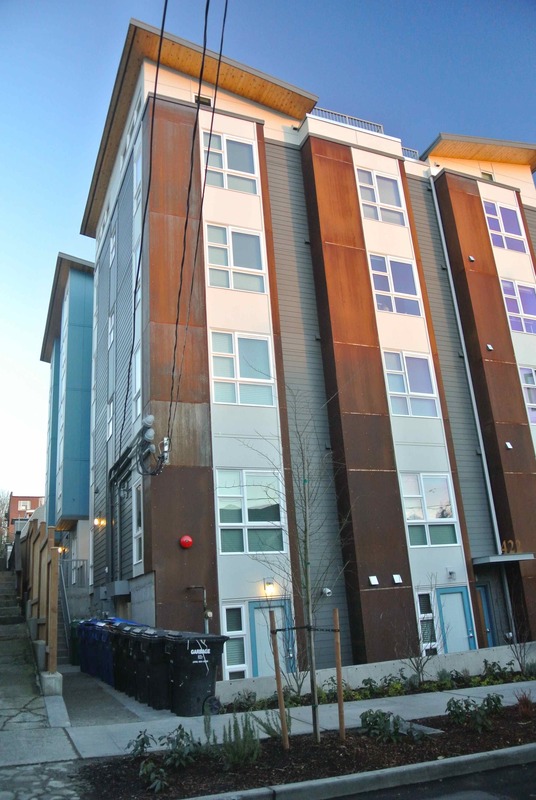 In December 2013, we posted pictures of a new 5-story building in the Lowrise 3 area of Capitol Hill that was using the sidewalk to permanently store garbage bins, thereby partially obstructing passage along the sidewalk. You can read that story on this page: “What happens when the city allows developers to circumvent Design Review“. We wondered at the time whether the developers of the building had neglected to make a space for the waste storage bins in their enthusiasm for maximizing revenue from every inch of the property. We also pointed out that other bins located alongside the building posed a significant safety hazard because they blocked the building’s electrical shutoff switches. The bins are off the sidewalk, but the safety violation are as bad as ever! Two weeks after our story went on line, the developer paved a section of the building’s green space to create a permanent site for the waste storage bins, thereby removing the bins from sidewalk. Two weeks after our December 2013 story went on line, the developers paved a planting strip to make room for these waste bins that had previously been stored, day in and day out, on the sidewalk. However, as you can see from the pictures above and below, taken on Jan. 4, 2014, the waste storage bins still present a hazard, since they continue to block the building’s utility panels, obstructing access to the electrical shutoff switches (see close-up picture below). Should a fire break out in this building, fire fighters would have to shove numerous large waste bins into the walkway, thereby impeding the exit of residents trying to escape the building. We are surprised that the Seattle Fire Department would allow this developer to violate such a basic part of the electrical safety code. 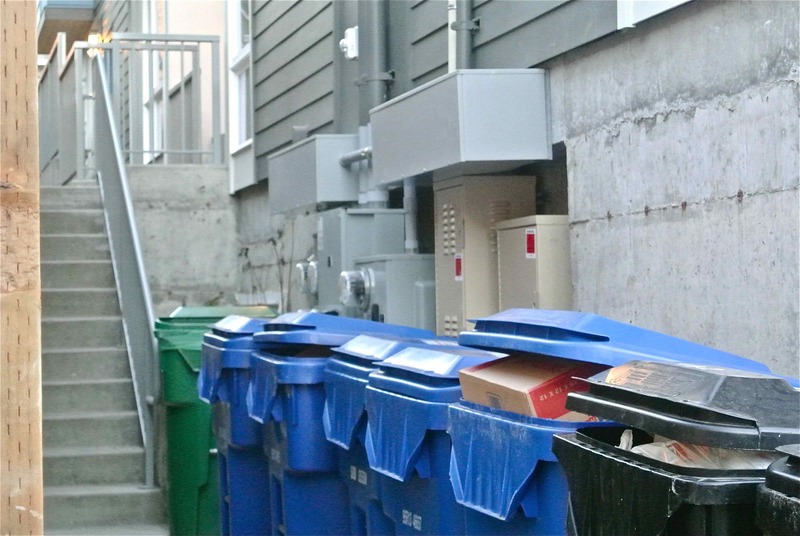 This picture, taken on Jan. 4, 2014, shows that waste bins continue to block access to the building’s electrical shutoffs. Electrical codes typically require unimpeded access to electrical shutoff switches. Will the chronically overfilled waste bins attract rodents? Many of the waste bins, including garbage bins, are frequently overfilled and open, potentially serving to attract rodents. Is the space provided by the building too small to hold the number of bins required to meet the occupants’ needs, leading to chronically overflowing waste bins? Does the city’s land use policy encourage irresponsible development leaving residents and neighbors to bear the consequences? Does this building meet green space requirements now that the planting strip is gone? Additionally, we wonder how paving over the planting strip to make space for these waste bins impacted the amount of green space on this property. Could it be that with the loss of that planting strip, the building no longer meets the Green Factor Requirement in the Seattle Land Use code that set minimum requirements for landscaping around a new residential building in lowrise neighborhoods? Is the Seattle Dept. of Planning and Development turning a blind eye to a potential violation of the land use code? Full design review, which this building circumvented using new loopholes in the code, allows neighbors and a panel of land use experts to ensure that the neighborhood does not suffer the consequences of developer’s maximizing profits at the expense of neighborhood health, safety, and attractiveness. Many other newly constructed buildings have circumvented full design review due to loopholes in the current Seattle Land Use code – of those, how many also have safety violations that have gone unnoticed? We only reported on this one because it was brought to our attention by concerned neighbors. City policy needs to be changed to curb the excesses of irresponsible developers!